I’m so thankful to have lived during a time when parental love is considered important. I have heard so many stories of people my parents’ age not receiving love from their parents. No hugs. No kisses. No “I love you.” And what’s shocking is that psychologists told them this kind of treatment is what would raise the best adults. If the experts are saying this, of course people will follow. 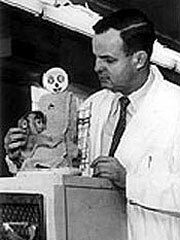 I am thankful one man, Dr. Harry Harlow decided to ditch this trend and research the importance of love. His findings of an infant monkey determined to bond with a washcloth monkey mother has changed parenting. It has changed us. Saturday’s “This American Life” was fascinating. Take a listen. Learn about monkey love and unconditional parent love for their children. This was such a good This American Life! It made sense of some stories I’ve heard about past generations.